Greater Prairie Chickens, like other grouse species, fight for the right to mate during lekking, or mating season. In an open area on the western Nebraska Sandhills prairie, Greater Prairie Chickens continue their timeless mating ritual of spring. Males make a strange and long, low hoot sound like blowing across the top of a bottle as part of their display. Greater Prairie Chickens small pockets in the Great Plains and are declining due to habitat loss, mostly to agricultural conversion. 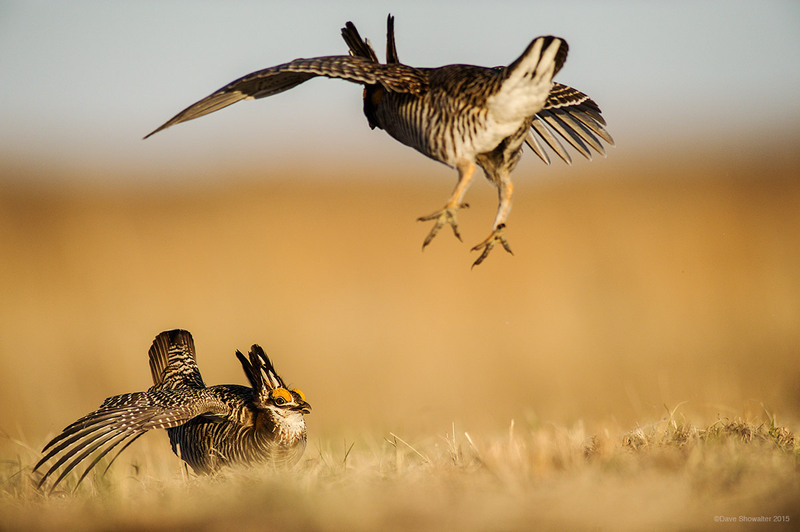 Calamus Outfitters at the Switzer Ranch offers prairie chicken and sharptail grouse tours and hosts a prairie chicken festival in the spring. Photo © copyright by Dave Showalter.